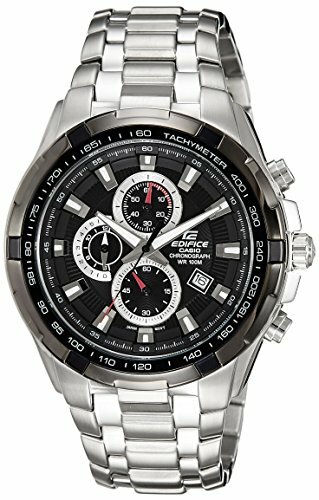 Introducing the sporty Casio Edifice collection. Brushed and polished stainless steel case (45mm diameter by 12mm thick) and link bracelet. Convenient tachymeter along the inner bezel. 100 meter water resistant case protected with a scratch resistant mineral crystal. Comfortably crafted link bracelet utilizes a fold-over push button deployment clasp.